The MCP3021 is a successive approximation A/D converter with 10-bit resolution. Available in the SOT-23 package, this device provides one, single-ended input with very low power consumption. 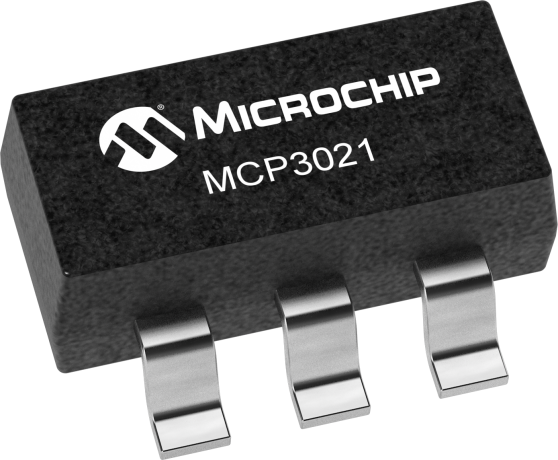 The MCP3021 provides a low maximum conversion current and standby current of 250 µA and 1 µA respectively. Low current consumption combined with the small SOT-23 package make this device ideal for battery powered and remote data acquisition applications. Communication to the MCP3021 is performed using a 2-wire I2C™Compatible compatible interface. Standard (100 kHz) and Fast (400 kHz) I2C™Compatible modes are available with the device. An on-chip conversion clock enables independent timing for the I2C™Compatible clock and the conversion clock. The device is also addressable allowing up to eight devices on a single 2-wire bus. The MCP3021 runs on a single supply voltage that operates over a broad range of 2.7 V to 5.5 V. This device also provides excellent linearity of ±1 LSB differential non-linearity and ±1 LSB integral non-linearity. Operating temperature range for this device is -40°C to +125°C. The MCP3221 PICtail™ Demonstration Board is designed to demonstrate Microchip’s MCP3221 device. The demonstration uses DataView™ Windows® software for a graphical real time data analysis from the board through USB. This demo board can also be used for firmware development to the MCP3221 device using the PICkit™ 1 Flash Starter Kit.